DLUX (Domain-specific Language User EXperience) is a one-year national exploratory research project funded by the Austrian research funding association (FFG) within the funding programme ICT of the Future (4th call 2015) of the Austrian Federal Ministry for Transport, Innovation and Technology (BMVIT) , contract #855465. Three partner organisations contribute to DLUX: AVL List GmbH, EclipseSource Services Vienna, and WU Vienna. In industry, the potential for introducing model-driven software development (MDSD) has been explored for the last years, yielding promising and concrete application cases. At AVL List GmbH, the world leading company on vehicle test beds, application cases emerged from AVL’s highly complex application domain of automotive instrumentation and testing involving software-intensive and cyber-physical systems (e.g., automotive test facilities with large, integrated sensor arrays). These application cases revealed a number of critical issues, which are common adoption barriers to model-driven software development in industry. The upfront investment for technology adoption throughout the organization remains unclear, as does the consolidation potential (e.g., avoiding data redundancy). There is scepticism among domain experts (e.g., sensor-firmware developers, facility-test developers) in the company regarding the ease-of-use of models and model-based tooling. This scepticism is partly due to perceived software-tooling limitations. DLUX aims at overcoming the aforementioned adoption barriers by developing an integrated approach for the evaluation of the model-driven software-development techniques under consideration and, as an exploratory project, sets out to develop an evaluation-method framework ("DLUX evaluation methodkit"). DLUX will identify and document critical artifacts for MDSD evaluation procedures in industry settings: enterprise software architecture, evaluation cases, documentation, and software prototypes. 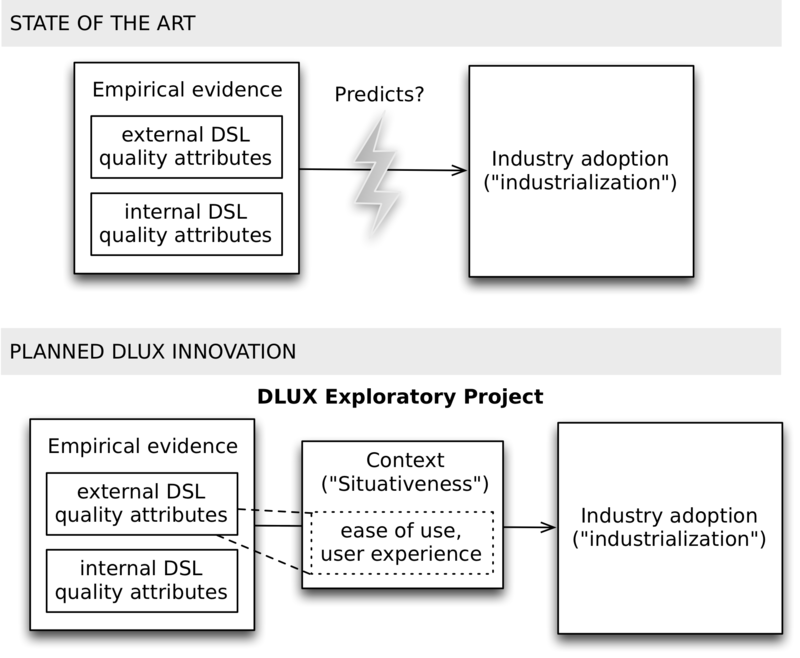 DLUX will develop empirical evaluation methods for model-driven software development techniques capable of reflecting on tool- and language-user experience in running industry projects, while limiting evaluation overhead and minimizing project disruption. Important by-products are a gap analysis on existing tool chains and industrial needs and back-channelling prototypical results to open-source software communities (Eclipse , in particular).